We carry all brands of high efficiency tanked and tank-less water heaters. Tank-less water heaters offer a more cost efficient method of heating your home’s water and making on-demand hot water a reality. Water heating is a thermodynamic process using an energy source to heat water above its initial temperature and is made up of parts that can fail. Maintaining hot water production is crucial to your home needs, whether the hot water is for cooking, cleaning, bathing, or space heating. Water heaters, boilers and heat exchangers are the mechanical processes used to heat water for a variety of domestic and commercial uses. Most water heaters are tank water heaters which keep a cylindrical tank full of hot water in your home at all times. The typical sizes for household water heaters with a tank are between 20 and 100 gallons. When hot water is required the water is circulated to the open faucet. Conventional tanks utilize electric, natural gas, propane, oil, solar or geothermal power as an energy source to heat the water. 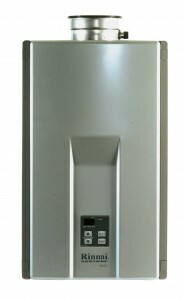 The typical electric water heater is wired to a 220-volt circuit. To heat the water, the current passes through electrical-resistance heating elements – usually two elements; one at the middle of the tank and one at the bottom of the tank. Power is delivered to each element through a thermostat. When the temperature drops, the switch closes to allow current flow, and it opens when the temperature reaches its preset. Thermostats can be set for the maximum water temperature–generally between 130 degrees and 140 degrees, or as low as about 120 degrees for increased energy savings and protection from scalding. A tankless water heater, also called instantaneous water heaters, provides hot water as needed instead of being stored, which is a way of saving energy and saving you money. Tankless water heaters are designed to heat water directly without the use of a tank and are more efficient than conventional water heaters. The primary energy sources for tankless heaters are natural gas and propane. Tankless heaters are typically more efficient than storage water heaters. The absence of a tank saves energy as conventional water heaters have to reheat the water in the tank as it cools off. With a central water heater of any type, water is wasted waiting for water to heat up because of the cold water in the pipes between the faucet and the water heater. This water waste can be avoided if a re-circulating pump is installed, but at the cost of electricity to run the pump and wasted energy to heat the water circulation through the pipes. Ameri-Mech heating and air conditioning has a full line of air quality products to enhance your Boulder / Longmont area home comfort. 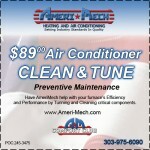 Call Longmont heating and cooling company Ameri-Mech at 303-975-6090.